Wind II Canvas Wall Art | Marcia Baldwin Figurines | One Price Low Flat Shipping! From the Marcia Baldwin Wall Art Collection, Equus Nine Canvas Wall Art. Comes ready to hang on stretched canvas. Measures 12" x 16". Comes packaged in branded gift box. 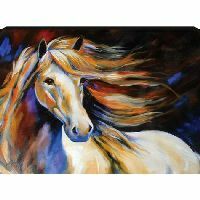 Subtle movement sweeps across this canvas oil painting of a white horse whose colorful mane is blowing in the wind.